Although this species can grow under very acid soil conditions, the best pH range is 5.0-5.5. High light levels induce wavier or crinkle looking fronds while low light levels result in smoother ones. Tipburn is often caused by excessive fertilization. Chill sensitive, store above 50 degrees F.
Being a true fern, it reproduces by spores, not seeds. The cultivar ‘Crispafolium’ produces fronds that are wavier. The specific epithet name nidus means nest. 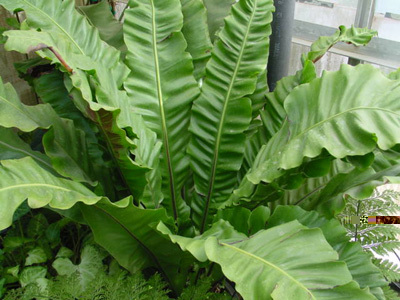 Asplenium: Greek for an allusion to a supposed remedy for diseases of the spleen. Classified as “epiphytes” or air plants as they grow on other plants and elevated supports. They are not parasites but obtain water and nutrients through a spongy covering of their roots.